20-Mar-2012 -- When you have free time what do you do? Go to the park or perhaps to a mall or maybe do something special something you will remember for a long time? That's exactly what we have decided to do - me and my friend since high school. I wissam nassir work for Serco cycle hire and my friend raed al-musawi who came here to complete his study of Civil Engineering and has completed the master's degree in engineering from London decided to visit this confluence. The first thing we did was to buy a GPS online and booked a flight from London to Belfast Northern Ireland. We head to airport early in the morning and arrive on time. We landed in Belfast international airport took pictures at the airport and then we went to pick up the car we booked or similar lol. 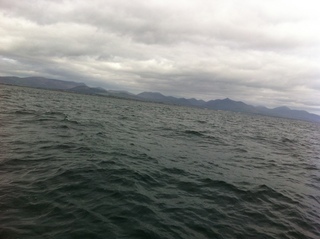 Once that was done we set off to Kilkeel the nearest seaport to the point that we intend to visit. We decided to go directly to Kilkeel, we were impressed by the beauty of Irish countryside as much as the kindness of the Irish people who did not spare any effort to help us get our destination. We went to the port to find the boat to take us into the sea, we could not find a boat easily because the season has not yet come, and most of the boats were on dry land for maintenance. That was until we found Oliver, who agreed to take us there, we agreed with him on the phone to take us the next morning. We were very excited for the day because we were afraid that we won’t find one to take us into the sea, but luck was on our side but not waves. The waves lifted the boat and bring it down, but Oliver’s sailing skill made all the difference, we tried to get to the point and take accurate reading it was a difficult task because the waves moved the boat right and left, but we were able to take a good reading, and took several pictures of all directions. On the way back I did not feel it because I was seasick, lying down until we got to the port hearing oliver and raed laugh and the sky is all that I remember about the way back. We were very happy because we achieved the goal that we came for. It was a special experience truly made us think again whenever we ate delicious fish to think about and respect the sailors who go out to the sea for fishing.